In today’s digital world, Huawei is working closely with partners to develop innovative ICT solutions, and helping global customers drive digital transformation and lead the trend. Its continuous focus on customer-centric solutions and strong partnerships is enabling the company to drive industry leadership and growth of its Enterprise Business Group (Enterprise BG). “Industry cloud is a business-driven digital transformation and is beyond the simple combination of cloud and industry; it is the integration of technologies into businesses. Digitized enterprises of the future will be about the production, transmission and analysis of data. It follows that they will require an ICT infrastructure that integrates cloud-pipe-device, and an open, flexible, agile and safe platform to forge close partnerships to develop rich applications and create an innovative, win-win ecosystem, which will drive the digital transformation of enterprises,” added Yan. Huawei Enterprise BG also Made Several Major Announcements at HUAWEI CONNECT 2016. 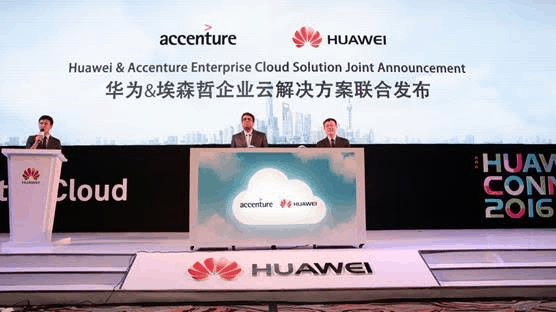 Huawei and its global strategic partner Accenture issued enterprise cloud solutions together. They jointly provide verified enterprise SAP and Oracle cloud solutions which are based on Huawei FusionCloud solution for global enterprise customers’ core applications to provide one-stop service. In the past two years, experts from Huawei and Accenture have worked side by side to develop enterprise cloud solutions to help clients reduce large capital investment in IT and meet flexible and scalable system requirements. Data analytics firm Lux Research reported that by 2020, the global Industrial IoT (IIoT) will be worth an estimated US$ 151 billion. The IIoT includes factory machinery and industrial products, with one typical example being the Internet of Elevators & Escalators (IoEE). At HUAWEI CONNECT 2016, Huawei announced that it will initial collaboration with Schindler Group, a leading global elevator manufacturer, to develop a Connected Elevators Solution that is open, flexible, and scalable. The solution can support the unified connection and management of Schindler’s one million elevators around the world. IoT technology transmits operational data from the elevators in real-time to enable elevator data simulation, achieving preventive maintenance through and cloud-based big data analysis. Elevator safety will be significantly enhanced, while the operational cost of the elevators can be largely reduced.